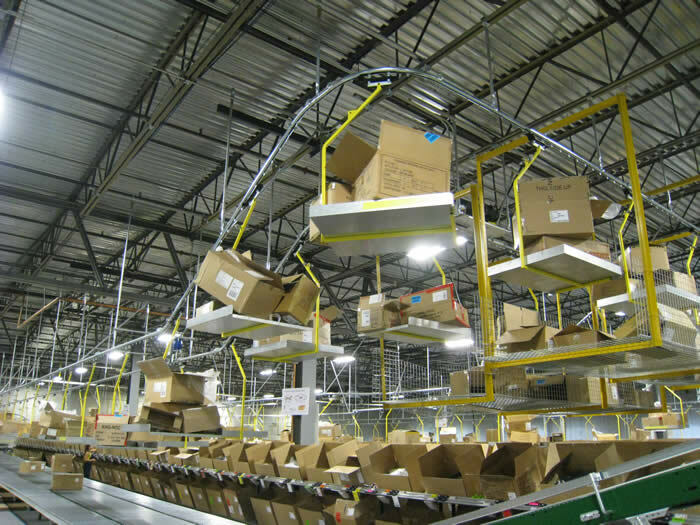 A very common application of overhead chain conveyors (monorails) is the removal of corrugated cartons from the order picking areas of a modern distribution Center. These areas are “high activity” work spaces and are often congested with personnel and densely packed with product, leaving little space for garbage bins and labour. So, the time proven solution is to take the trash cartons somewhere else in the facility where they can be dealt with efficiently, usually to the area of a trash compactor. In the last ten years, a combination of “Green” environmental initiatives and increasing cost of raw materials such as corrugated paper have changed the way we look at and deal with the trash cartons that come from our DC’s. Good, clean corrugated material is worth some money if it is prepared so that it is easy for a recycler to pick up and process. If it is uncontaminated and strapped properly, the recycler will pay top dollar to haul it away. 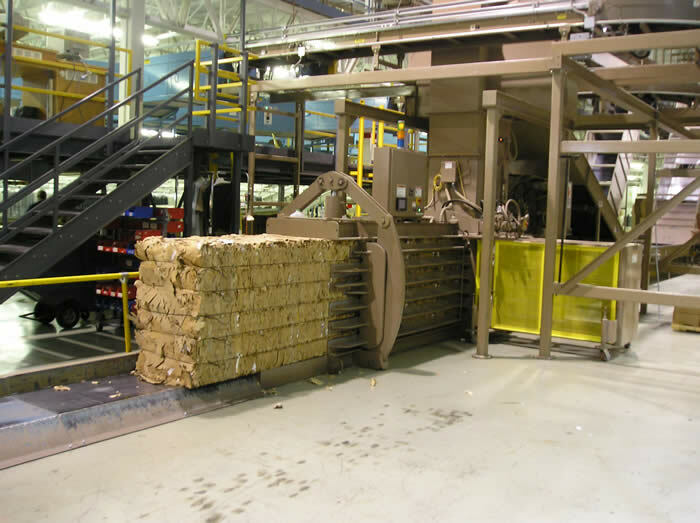 An overhead conveyor can play a very important role in developing an efficient system to get empty trash cartons from the source to the automatic compaction system. An overhead conveyor can wind through picking areas close to the workers so that they can easily feed these cartons onto conveyor “hooks” or “trays”. The conveyor will carry the cartons to the infeed hopper of a corrugate compactor, and automatically dump. But the value of the corrugated trash itself could become a bigger part of the justification than the three items listed above. I recently spoke to a fellow who suggested he would actually supply the entire system for free if the customer could consistently generate a minimum supply of the corrugated material for his use. I thought he may be exaggerating, but if even half the cost could be recovered we could help customers justify implementing our conveyor system. And these systems do not have a short shelf life, they would last for more than ten years, a good portion of which they would be supplying the owner with regular income.